Has your site been hit by Google Panda or Google Penguin? April 24th 2012 is the best indication that Google’s off-page Penguin algorithm is the cause of your penalty. If you see a drop in traffic on or around that date, then your linking profile is the cause. Whichever keywords dominate your exact match anchor text will usually be the ones hit hardest by Penguin. To see the most used phrases in your back-links, utilize the free SEO tool at majesticseo.com. Keywords used in linking profile needs to be kept below 5% link density. The vast majority of your linking profile should be made from Brand links, URL links and junk links. Your registered company name is ideal for a Brand link. Use different types of web addresses for your URL link creation. Getting links from various C Class IP addresses is very important for your back-linking strategy. It is more important than ever that your links originate from relevant sites instead of random content sites. The PR score and trust score are really important for your back-links. Google’s Penguin algorithm wants to see that your back-link pages have back-links themselves. You should avoid automated link networks because Google doesn’t like site owners using them and sooner or later you’re going to be penalized for using them. If you have used an SEO firm for link building then you should check that they don’t use any linking networks to create links for you because Google’s web spam team are working to identify all the link networks being used to manipulate their results and when they associate your site with a network, you will be penalised in Googles SERP’s. The optimum on-page keyword density for each of your website pages should be around 2 – 3%. A link from your content to an authority .gov or .edu site will help your search engine rankings. Building links from inside your content using text keywords is good SEO practice. You can link either to other pages within your own site or link externally to trusted ‘authority’ resources. A good video will drastically increase the time that visitors spend consuming your site content. You should also use graphics to make your content more visually appealing and to break large areas of text into smaller more readable sections. The image alt text attribute is the best place to put long tail keyword rich image descriptions. Use different variations of phrases for each image. When you publish new content it is best to run it through a spelling checker, which will highlight any errors. You want your content to convey quality and bad grammar and spelling errors will decrease your website quality score. You should always write as much or little as you need to in order to get your message across. Having said that, our evidence is that above 500 words, your site content will have extra weight in search. Always write for your visitors, not for search engines. If you write for Google, you will get traffic, but that traffic won’t like your content very much, so won’t stay very long on your site to read it. Using different words that have similar meanings is a good practice, because Google can associate those keywords using latent semantic indexing (LSI). This allows you to write more natural sounding content without having to repeat your primary keywords throughout your page. Google is increasingly relying on their mobile algorithm to determine all their ranking results, even on PC’s and laptops. This means that if your site isn’t mobile friendly (check your site here) then you will not just be missing out of the 50% + of interested potential visitors using tablets and smartphones, but all your other traffic too! If you have mobile compatability issues, get advice from leading low cost mobile website designers www.cheapresponsivewebdesign.co.uk and take your website to the next level. Check all the pages of your site for duplicate meta-tags using Google webmaster tools. All pages should contain unique data, if you have duplicates edit them because you will be penalized in the search results. The page meta description is “usually” used in SERP’s under your page title. This is an chance for you to increase click through rates from the search engines which counts as a way of measuring your sites user engagement. Slow loading sites never show up in Google’s results so make sure that your site has a fast load speed, otherwise you will never get the rankings you deserve. The proportion of visitors that don’t like what they find on your site and hit the back button is called the bounce rate. 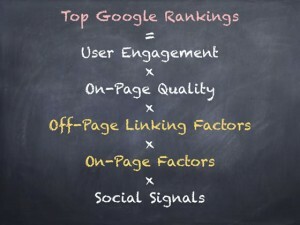 Your website’s bounce rate needs to be 55% or less for top Google rankings. The amount of pages each visitor looks at per visit is another metric that Google uses to determine the quality of your content. The more pages viewed by each visitor, the better. If your visitors remain on your sites pages for a long time then Google rewards you for providing quality content. Try to improve the average time on-site as much as you can. Address all the issues above and your website SEO will assist your search engine rankings and drive more organic traffic to your door. If you need help optimizing your website visit Deeho SEO and let their Bedford SEO specialists optimize your site. Organic traffic is the most cost effective way to increase your traffic and only requires the consistent application of proven optimisation processes to work for you. This entry was posted in Internet & Computers, SEO on May 3, 2014 by admin.